Some more fun today with the Nex and some legacy lens. Todays shot was taken on an old soviet Industar 26 – a 2,8/52mm lens. Shot stopped down to 2.8 I was happy with the images it gave me today, even with todays image being shot at dusk – credit to both the land and the Sony. In Devonport, on the North Shore is a fair sized gold club (swamp land a long time ago). Surrounding part of this is a small stream/river, and a mass of ducks. Fed often by locals, there has been an increase of Pukeko in the area also. Pukeko’s, known overseas also as swamp hens are one of New Zealand’s more common iconic birds. 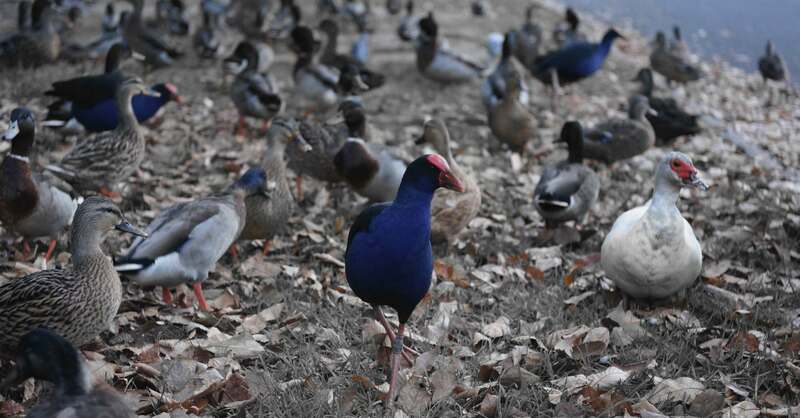 The have a beautiful purple coat and amazingly dexterous feet. Whilst they can fly, its not often you see them doing so, and they more often then not retreat from ‘whatever’ on foot. For todays image I selectively desaturated the image to ‘reveal’ and highlight the Pukeko amongst the Ducks. Shining in the center of the image, I liked the final result with the Pukeko creaping forward into my image as most of the other birds just ignored me.